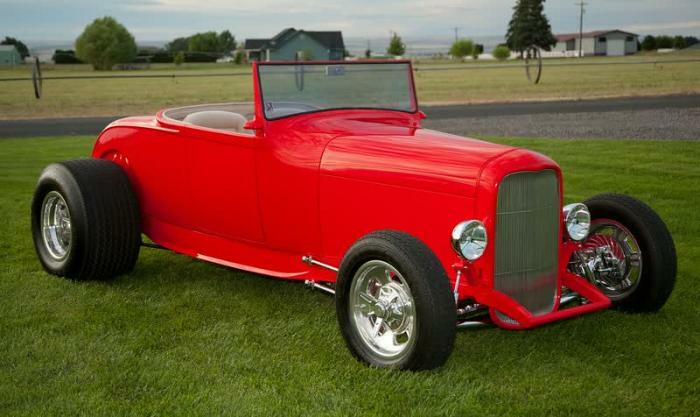 1929 Ford Roadster LT1 Hot Rod! Make Offer! This is a very high Quality Build with all the right choices and no details spared! The Ford HighBoy's never go out of Style and when it comes to street rods this is a timeless example! Deep Pockets build perfect well thought out cars, but never see any return on investment. As most of you know the best way to buy any restored car is to buy it already done with pennies on the dollar. It saves you a ton of money and all the pain, agony, stress and sleepless nights - How do you put a value on that? This incredible Ford HighBoy is built to go from street to show. THE BODY AND TRIM: The spectacular Rosso Corso Red Wescotts fiberglass body was obviously cleared and wet-sanded, buffed and polished to a mirror. With only 1500 miles on this unbelievable build, this HighBoy will no doubt turn heads , get thumbs ups and waves all over town! This bad-boy Roadster is flawlessly well-done! At the front of its body, Rosso Corso frame, spotless stainless grille, hidden turn signals and chrome headlights. At the sides of that hood, a characteristically clean and simple profile presents shaved door handles, hidden door hinges and clean straight lines. And at the back is a hide-away license plate, smoothed in tailights and very sleek hidden third brake light. Clean sleek built in mirrors attached to the front windshield frame! THE INTERIOR: Inside this HighBoy is lined with a wood reinforced beautiful Tweed Tan interior! She looks stunning and creates a great contrast to the car's Rosso Corso exterior. Bucket Seats are firm, provide good support and feature sturdy lap belts. The stunning Red dash shows nicely with a perfect gauge cluster set up. Billet Hood/Trunk latches. high quality carpet, which flows from a custom firewall cover, anchors color-keyed mats between billet pedals. Custom fabricated center console houses the beautiful billet shifter arm and knob. In front of the driver, a polished Billet steering with leather trim around shiny chrome steering column. Completely upholstered trunk with custom battery box and features enough storage for chairs, a small cooler and the car's nightly trophy take. THE ENGINE/SUSPENSION: This Roadster has a Corvette LT1 fuel injected motor with a 400 trannny - reliability, performance and drivability is the name of the game! This Roadster also has the OBD on-board computer system. Polished true-dual exhaust system. Wait! 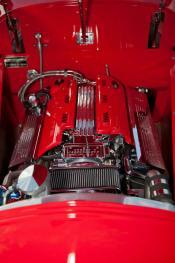 Scroll back up to those pictures and look how well all the details were thought out and how clean this engine compartment was done! Steel Braided lines and Billet through out the engine compartment. Solid radiotor pipes In accordance with its fully detailed exterior, nothing was missed under the hood of this build. And everything from the painted corvette engine covers to its chrome oil pan and chrome-covered motor mounts. You can practically eat off the bottom of this Roadster! Under this roadster's well-planned and professionally build is an open bank account of an entire catalogue of custom performance parts! Chrome front suspension, Halibrand quick change rear-end suspension, which features chrome coil over shocks, which produce modern ride and handling. Turbo-Hydramatic 400 4-speed surrounded by chrome and polish stainless! This Roadster oozes with quality! Four wheel disc brakes stop this bad-boy in it tracks! Hellibrand polished wheels which are wrapped in Mickey Thompsons rubber. No expenses was spared! All the wiring is hidden in the fram all the hard lines are chrome or polished - Seriously look at the pictures! THE DRIVING EXPERIENCE: How do you even begin to explain the experience, this is "American Culture" at its best - Cruising! You can take this Roadster to a burger run|local cruise nights|meets|shows and National events! There is no explanation for the experience from cars to people! Let the memories and experiences begin! !